This is part of CNET's Road Trip 2017 summer series "The Smartest Stuff" about how innovators are thinking up new ways to make you — and the world around you — smarter. A little after 2 p.m. on an impossibly muggy summer day in June, I squeeze my sweaty, 6-foot-1-inch body into the passenger seat of Antonio Puliafito's shiny black Maserati. As excited as I am about speeding along the Italian coast in a luxury convertible, Puliafito isn't showing off what his nifty '90s-era, 6-cylinder Italian sports car can do. He isn't even particularly interested in the ride, though we both relish the breeze after a punishing day in the heat. Puliafito wants me to look at his phone. On it is a map of the area we're navigating in the hilly city of Catania on Sicily, the island just off the toe of Italy's boot-shaped mainland. The city dates back nearly 2,800 years, when the Ionians settled there. Today, Catania is home to 313,000 people, in addition to industrial, chemical and manufacturing companies like pharmaceutical maker Etna Biotech. I've flown more than 6,568 miles from the heart of the tech revolution in Silicon Valley to this coastal Sicilian town where I was promised a taste of the future. And maybe some pasta. More specifically, I'm here to get a glimpse of what the city of the future will look like. I also talked to people working on smart city projects in London, San Diego and Louisville, spoke with experts across the tech industry -- including "father of the internet" Vint Cerf -- and sat down with Chicago Mayor Rahm Emanuel to understand how governments plan to make their cities "smarter." Sicily is working to become home to some of the world's truly smart cities: A place that keeps its streets clean by alerting the sanitation department when public garbage bins are full. A place where you can unlock your office door and turn on your computer before you even arrive at work. A place where you can learn about a medieval building's rich history just by pointing your phone at it. And a place where that phone can also find, reserve and direct you to a parking space with the tap of a button, which is what Puliafito is about to show me as we steer around Catania's mountains. Puliafito, 51, calls this two-year prototype effort SmartMe. With it, the University of Messina computer engineering professor wants to push the cities of Catania, Messina and Palermo alongside the techiest cities on the planet — and ahead of San Francisco and San Jose, in California's storied Silicon Valley. If Puliafito and his team of programmers, designers and partners succeed, the sensors installed in parking lots and on buildings, bus stops and trash cans -- and everyday objects in between -- will plug into SmartMe and talk to one another as well as our phones. Just as important, all that information will be pulled together on the SmartMe website, where everyone can see it. "What we're trying to do is to integrate all these different services together," says Puliafito, who also leads SmartMe.io, a spinoff from the University of Messina that's hoping to bring this technology to more cities that want it. "People will realize that they live better." We're already familiar with technology that lets us hail a car, order pretty much anything from Amazon, and speak commands to control our phones, light switches and garage doors. There are also mobile apps that help us find and reserve parking spots in a few major cities. But few, if any, have tied all these services together in one system. The team in Sicily may actually make it happen. Take that parking app I'm looking at as Puliafito drives me around Catania. It's directing us to an open parking spot because a sensor embedded in a parking space tells us it's free. The information is then uploaded to that map on Puliafito's phone, where it shows up as a blue box with a white letter P in the middle, for "parcheggio" (Italian for "parking"). Puliafito asks me to tap on it. "See?" he says. Then he tells me to click a blue arrow on the bottom of the screen, and the map gives us driving directions. Down the street, we take the third exit on the roundabout, go up the hill, and see an empty spot on the right. Puliafito, in red glasses and wearing a gray suit -- sans jacket because, really, that heat -- parks his car and we watch as the blue box on the map turns yellow. I tap again, and it says two spots are now available. "In Italy, we have old cities and we really struggle finding a place to park," he says. To create a smart city in Sicily, Puliafito's team basically had to start from scratch. Plenty of people in Sicily have phones, but the local cities estimate less than a fifth of the population has ever used them to connect with the government. On top of that, many of the cities face issues that go beyond what tech alone can easily fix. Trash overflows in some areas, piled up on the side of the road covering what used to be orderly trash bins. Marked parking spaces are treated as suggestions. And some roads are falling apart so badly they feel out of place in modern Europe. A tech hub, Sicily is not. But there's an upside for the SmartMe team, since there aren't any legacy devices to work around: They get to start fresh when installing sensors, internet-connectors and other tech. They did it first in Messina two years ago, before expanding into neighboring Palermo and Catania. SmartMe is also partnering with Sicily's burgeoning tech scene, hoping to drum up excitement and draw a portion of the $15 million in tech investments promised by the local government. SmartMe already collects the real-time locations of taxis in the city and knows whether they're free to take a fare. The team has also built an app that detects potholes, automatically putting them on a map as you and your phone encounter them on a drive. It can also track parking lots, like the one we're driving toward at Advanced Technology Solutions, a clean-room consulting and services firm that's about a 20-minute drive from bustling Aeroporto Internazionale Catania, where Puliafito had picked me up earlier that day. The bus stop across the driveway from the company's building has a solar roof and a touchscreen display to pull up information on bus schedules, the weather and pretty much everything else SmartMe knows. There are two USB charging ports. The shelter has heat, humidity and sound sensors that feed data back into the system. Ada Di Stefano, who heads up research and development at ATS, which set up that bus stop's prototype system, says the data being collected could help a city track traffic patterns or respond to air quality issues. There are limits to what she thinks all this futuristic tech can do, though. She laughs when I ask if the buses will get better. "No," she says. "It would be the same." If you wanted to list the world's techiest places, you'd probably start with Silicon Valley. Maybe you'd throw in Seattle, Japan, China, Korea and Singapore, too. Messina, not so much. There's reason to be skeptical. Messina's history is, well, history. Messina's claims to fame include being an outpost for the Crusaders on their way to the Holy Land. It was captured, looted and burned in 1190 by England's Richard "the Lionheart." Messina was devastated by an earthquake and tsunami in 1908. And in 1943, it was where American Gen. George Patton beat British Field Marshal Bernard Montgomery in a race to retake Sicily for the Allies. Today, it's perhaps better known as home to the University of Messina, founded in 1548. Messina also makes for a fun, scenic backdrop for vacationers. Massive cruise ships routinely disgorge hundreds of passengers into the city's town square to see its elaborate bell-tower statues move to a blaring rendition of Franz Schubert's "Ave Maria" when the clock strikes noon. There's also Mount Etna, Europe's largest active volcano, about 60 miles away. It's one of the oldest, continually active volcanoes in the world. Its eruptions were even mentioned by Greek playwrights and historians as far back as 475 BCE. Messina seems like it should be stuck in the Middle Ages compared with San Francisco. Yet, while the people who live in and around Silicon Valley help dream up stuff like our phones, the apps that power them, the search engines we use and the social networks that have taken over our lives, Silicon Valley has nothing like SmartMe. "I am absolutely mystified by this," says Vint Cerf, whose work at DARPA helped develop the internet. He's now vice president and chief internet evangelist for Google. Cerf's not sure why one of the techiest centers on the planet doesn't have a single, truly smart city, but thinks cost may have something to do with it. "A smart city development is a long-term play, not something we do over a month or a year," he says. "Maybe there is just no appetite for that." Some cities are finding ways to build more-limited projects. In February, San Diego struck a $30 million partnership with GE to upgrade its aging street lamps with energy-saving LEDs. Those will last up to a decade instead of the one to three years the city's getting now from its current lighting. That $30 million will also go toward cameras, microphones and sensors on 3,200 street lights -- the first step in helping San Diego monitor traffic and spot crime. There's also an app-powered electric taxi system offering a free ride anywhere in the city's downtown area. Free Ride Everywhere Downtown (FRED) costs San Diego a quarter of what a downtown shuttle system would cost, while moving the same number of people. "At the end of the day, this has to be practical," says David Graham, deputy chief operating officer for the city of San Diego. "The city I want to build is one that's accessible for all and practical for tackling problems." Chicago, meanwhile, is digitally mapping its complex system of underground pipes and conduits for sewer, water, gas and electricity, so construction and maintenance workers don't have to rely on dozens of incomplete and outdated records. London's newest Crossrail trains may eventually tell you where there are open seats, and where best to stand on a platform to snag one. And CNET partner city Louisville, Kentucky, created a network of solar-powered, wireless sensors to detect fire alarms going off near vacant buildings. San Francisco has a few projects under its belt, too. It modernized more than 28,000 parking meters around the city over the past six years so people can pay on their phones. And it was one of the first to make real-time bus information available to app makers, helping kickstart a cottage industry and debate about public data. "We can do the things you need to do while also doing some things that are preparing for the future," Chicago Mayor Rahm Emanuel tells me. "If it's something that helps people, and not a bunch of policy experts, the public will be supportive." Messina isn't the only smart city. Barcelona, which has been called "the most wired city in the world," has installed sensors, computers and cameras to monitor noise, traffic, parking spots, pollution level, garbage bins and even crowds. And Singapore is putting in a network of sensors and cameras across the island city-state that will let it monitor everything from the cleanliness of its public spaces to littering and cigarette smoking in smoke-free zones. Coordinated by Singapore's Smart Nation bureau, the effort will eventually help predict the spread of infectious diseases in the equatorial climate, and how crowds will react to an explosion in a shopping mall. Other smart cities include Amsterdam, Copenhagen and Dubai. All are wealthier than Sicily, where the average household income is around 16,000 euros (about $19,000) a year. The SmartMe initiative shows what's possible when there's more will than money, thanks to readily available mix-and-match software. It started two years ago, when Puliafito launched a crowdfunding campaign to spread about three dozen internet-connected sensors around Messina. These devices, which cost about $115 to build, would take readings on ambient temperatures, noise levels and air quality. That data would then show up on a website for anyone to see. Puliafito asked for about $17,200. He got more than twice that, proving there was community support for the project. "We didn't want to impose a framework on the community," he says. "We wanted them to be part of it themselves." Operating on a shoestring, Puliafito and six computer engineering students started working with partners like chipmaker STMicroelectronics, Arduino and the Raspberry Pi Foundation. Within the year, SmartMe's map added a fleet of taxis sending real-time locations and availability. There's also an app that tells you the history of city landmarks when you point your phone's camera at them. It's good for tourism, Puliafito says. SmartMe also wants to stick sensors on city trash bins so they can automatically alert garbage collectors when they need emptying. And they're experimenting with tech to automatically map potholes using an app on people's phones. 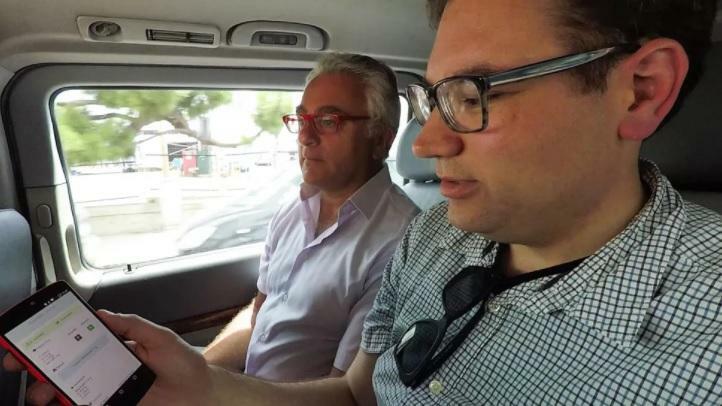 Puliafito and I ride in the backseat of a taxi one afternoon in Messina, as I run the pothole detector on a phone. The phone sounds a "ding" every time its sensor detects a pothole we hit while driving above 6 mph. From a tablet, Puliafito pulls up a city map showing all the reported potholes that anyone, including government repair workers, can see. "This way, the people become the sensors," Puliafito says. SmartMe has also installed a heat sensor showing the crowds at Catania's airport. That helps airport staff monitor crowd congestion and tells you how much time you'll need to get through the lines. Because the images are broadcast over the internet, the team opted to use a heat sensor instead of a camera, since it only shows people's blurry gray outlines — and not their faces. "We need to balance security procedures and also the innovation of technology," says Daniela Baglieri, president of Catania's airport. "If it's anonymous, why not?" SmartMe has even built a system that detects when you get close to your office, then automatically opens doors, unlocks gates and turns on lights, computers and air conditioning so you can jump right in to work when you arrive. Marta Mammana, a 24-year-old waitress at a local coffee shop, tells me she'd welcome an app that helps her throughout the day. She particularly likes the idea of making it easier to find a taxi. "It would be wonderful," she says. Still, she'd be more comfortable if the government provided the service rather than a private company. She realizes that all this information could be an invasion of privacy. Al Gidari, director of privacy at Stanford Law School's Center for Internet and Society, says cities need to work through such issues before starting these projects. That includes deciding how long to keep data, who has access to it and under what circumstances. And legislators, he says, need to grapple with new questions, like whether you can appeal if a smart parking meter gives you a ticket. "There's this raft of thorny privacy issues that haven't been worked out, but all the data's already been collected by the time we get there," he says. "They ought to all [stop and] take a deep breath." When I asked Cerf what he thinks of smart cities, he tells me he's excited by the promise of automation, like the possibility of a city being able to dispatch firefighters, police or emergency responders before anyone calls 911. "You could imagine activating one of these things under the right conditions," Cerf says. Back in Sicily, Puliafito and his team continue to work on integrating all of the technologies that will make cities healthier and easier to live in. He realizes it's as much a social revolution as it is a technical one. "You have to convince [people] this service is really going to improve their lives," he says, "so they are in some sense 'obliged' to use these services as something normal." After spending a few days with him and his team, it seems like he might actually pull it off. This article was originally published on CNET.